Back in November I heard that Justin’s sister, Katie, really got into Brie lately. So I thought to myself… hmm… I have 4ish weeks to make her a Brie (Camembert size) and it will be a little on the young side, which will be perfect. Christmas gift, check! So I brought 2 Camembert size Bries and 2 St Marcellin size ones. The first bigger one was munched on by her, Justin and I…. little wedge by little wedge and woosh it was gone. The second one, I wrapped it in a pre-made (didn’t have the patience to go for homemade) puff pastry. 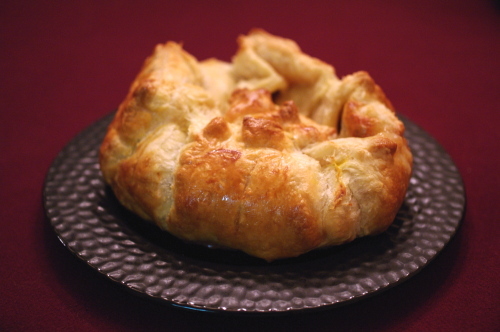 You know how many times you have to fold the dough to make puff pastry? Too many, that’s how many. Anyways… puff pastry with some homemade jam (see, I make other srtuff than cheese) and some crushed almonds. I baked in the oven for a good 30-35 minutes and it turned out golden, melty, yummy. Maybe a little too doughy for me, but still really yummy. The Brie practically dissolved. Next time, I might try Phyllo dough. phyllo dough is brutal…if you do try it, make sure it’s well buttered and keep it covered with plastic wrap to prevent over-drying. It takes a lot of practice and a whole lot more of patience. =) I’m sure it’ll be a fun experience though! Make sure you buy (if you do not have already) the brush to brush on oils/butters, works wonders i tell you. I tried doing it with a paper towel the first time, I almost used up my entire butter stick! Katie – haha! We’ll you don’t have to get on your knees, but I will need some time. I’ll makes some more sometime soon, but it takes about 3-4 weeks before I could ship it to you, which I don’t even know how I would do that yet… But soooo glad you liked it! 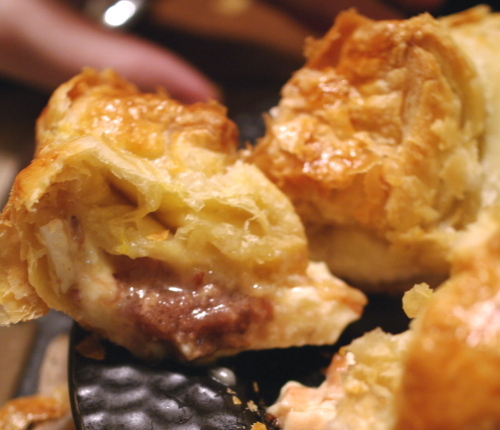 Kim – Yeah I’m sure that Phyllo dough is, well, challenging. Funny enough, I have the patience to make cheese, but I don’t have as much patience to make dough. Probably would end up getting the pre-made version. But I DO have a brush! I use it all the time, especially to glaze Trader Joe’s Chocolate Croissant (frozen aisle) with a beaten egg to make it shine when it cooks. yum!